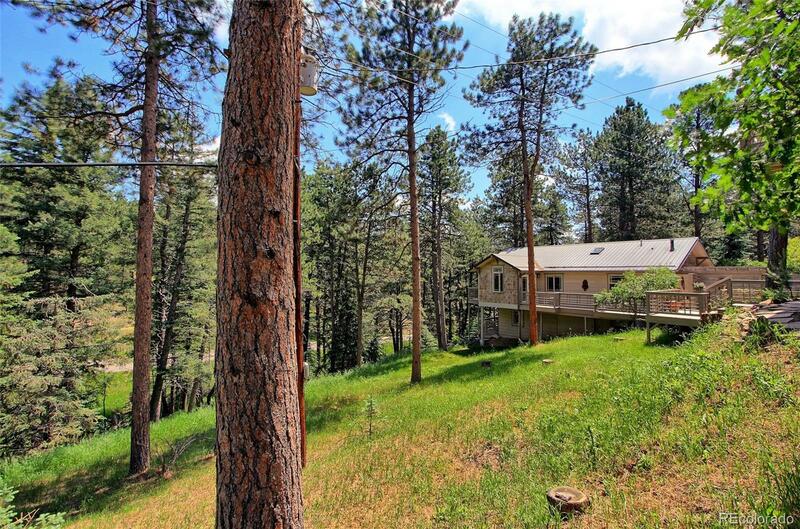 This beautiful secluded home was remodeled in 2012 sits on 3.8 acres. Above the detached 3 car garage is a in-law/guest/renter residence. Close to C470 & US285, the beautiful corner lot where the deer and elk play in Pine Park Estates has been professionally landscaped. This home has a 1216 sq. ft. wrapped around deck w. flagstone, patio & gas fire pit w. hot tub, outdoor pizza oven. SS appliances, 4 inch oak hardwood on the main, with master on the main with open floor plan, gas fireplace, newer carpet downstairs with walk out basement, and Millguard windows throughout. Drive in and drive out driveway plenty of room for RVâS and guest parking. This little gem is a hidden surprise. Donât miss Colorado living at its finest with no HOAâS and no Covenants. The guest house above the garage has a microwave, stove and refrigerator. 3 beds & 3 baths are in the main home with 1108 up and 1108 down. 1 bed and 1 bath are over the garage with 528 sq ft.